The Sign Maker for the very best in Bespoke Signs and Memorials - Beautiful Memorial Plaques created by our skilled craftsmen and designers, just the way you want. With such an array of memorials available it can be difficult to decide which type of memorial or memorial plaque is right for you. Click on the links below which should give you some ideas. On all the plaques we can include images to make your plaque more personal. We also create the design just as you want it - traditional or modern, minimalist or decorative. 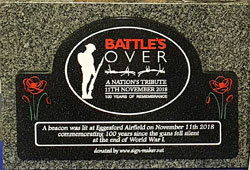 If your are not sure of how you would like your memorial plaque to look or are in need of inspiration, have a quick look at this page first. It contains lots of photos of memorials and memorial plaques we have made for our customers. We have included details about each plaque. These signs are ideal for maintenance free memorial plaques. They are very durable - made from 2 ply 3mm exterior grade flexible acrylic which is weather proof and UV resistant. The letters are engraved through the first layer of laminate to show the colour underneath. The silver and black looks very appropriate, especially if mounted on a wooden backing board. Brass is a very traditional material for memorial plaques. They are often engraved in a script font with unpainted letters. However we use many lettering styles and as long as the letters are over 10mm high we can infill with black, white, blue, green, orange, yellow or red. We have wooden backing boards and crosses on which to mount the memorial plaques if required. 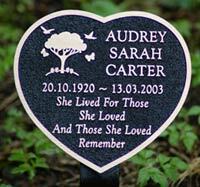 These plaques are ideal for memorial plaques as they look smart and are are maintenance free. They are made from 1.5mm black anodised or coloured anodisal aluminium. The letters are engraved through the black or coloured layer of laminate to show the silver colour underneath. A modern material with a cold stone like finish. It is perfect for memorial plaques in that it is very durable, fade proof and virtually maintenance free. It comes in a variety of colours. It also has the advantage of being able to engrave and paint fill, small letters. Full colour inlays made from tough anodised aluminium are also available if required. Also available in two tone. In our digital age it is becoming increasingly popular to remember our loved ones with a photo memorial plaque. All we need is a good colour photograph or image, along with your words of remembrance to create a beautiful plaque. These plaques look really classy when mounted on a wooden backing board. Made from tough digitally printed anodised aluminium. These slate & granite wedges or plinths are 100mm at the back and 50mm at the front. This provides a sloping plinth to mount a corian, engraved brass or bronze plaque. 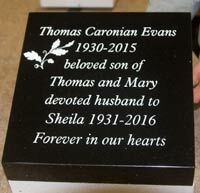 Alternatively we can engraved the lettering directly into the granite or slate. Good value standard sizes plus bespoke sizes as required. Lovely stone memorial tablets made from slate or thick granite. We have slate in various thicknesses plus five different granites. The slate is a natural slate with all its beautiful markings. These memorials are intended to be set into a lawn. If you wanted to fix to wall or other structure we would suggest using 20mm thick stone. As always we will create a unique stone tablet to your own design. 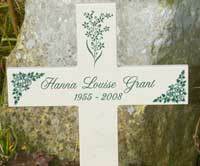 We can also make larger memorial stones in Slate, Granite and Purbeck Stone. There are Celtic Grey and Black Granite boulders along with Purbeck Stone boulders which can be used for Memorial Stones, Rustic Headstones or even as a stone entrance sign. Traditional and timeless and virtually maintenance free. The very latest in pattern making technology is combined with the very best of traditional craftsmen skills to offer you the best of both worlds. Ideal for information signs, house signs and memorials. Can use customer own artwork and letters can be as small as 4 characters to the inch. Small and large plaques available. We can make a war memorial in any of the materials we use. The cast bronze is superb, very long lasting but the most expensive. For smaller plaques the hand paint zinc with raised letters is somewhat similar, again very long lasting and very effective. Brass plaques are still very popular, with the 3mm option being the most appropriate. Engraved stone-like corian is more often used than stone itself as we can engrave with more detail than is possible with real stone. New to scene of war memorials are the engraved wooden tablets. Our wooden memorial plaques are very elegant and very beautiful. 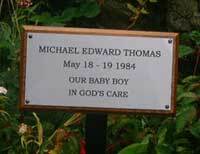 Plaques made from wood feel very natural and are often more appropriate to use than the rather formal engraved brass. Oak memorials are beautiful but for least maintenance we suggest iroko. These can be fitted with a wooden or metal tree stake. The beautifully made wooden cross are available in four sizes. They are normally hand made in oak with either a stake end or a flat end for wall mounting. Lettering and images can be lasered directly into the wood or onto a plate which is mounted onto the cross. More expensive, but longer lasting than wooden crosses and require no maintenance. Standard or celtic crosses in four colours. These beautiful plaques can be made in a variety of sizes using Oak or Iroko. For outside use Iroko is often considered preferable as it is full of oil. Oak is also used as it is very beautiful but must be well maintained to stay looking at its best. Wording and images are engraved into the wood using our latest laser technology. The results are simply stunning. These can be fixed onto a metal tree stake if required. Our wooden caskets and urns have been designed for cremated ashes. They are beautifully made from solid oak or mahogany and can be supplied with or without an engraved plaque. These can be brass, aluminium or acrylic laminate memorial plaques. The wooden caskets are perfect for those wanting to keep the ashes of a loved one, although they are also used when burying ashes in a cemetery. They are the most appropriate type of urn for this type of memorial event. These metal memorials are made from zinc plate, which is strong, tough and does not rust or tarnish. The background is etched away leaving the lettering, numbers, border and images raised. The background can be painted any colour you want and the images can be painted as well if required. These memorials are made from embossed aluminium, just the same way as a vintage number plate. They are very durable as the colour is stove enamelled onto the plate. Lots of colour-ways. These sturdy moulded plaque holders measure 295mm in height and hold a 1.5mm thick engraved 119 x 68mm. They are ideal for plant stakes, grave markers and memorial tree stakes. The plaque is included in the price. Materials include brass, aluminium, stainless steel and acrylic laminate. A cost effective solution. 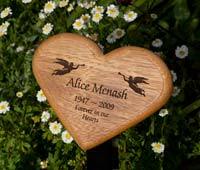 Heart shaped memorials and memorial plaques can be made in black or grey granite, cast bronze and aluminium, oak or iroko wood and corian in any one of the stone colours. There are a number of standar sizes and the corian or wood can be cut to any size. Wood or metal stakes are also available. There are some woodland burial sites which require the memorial plaque to be all wood, having no metal fixings at all. This is not a problem. 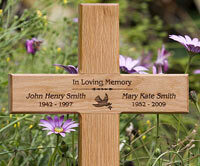 We have carpenters on site and can make bespoke wooden memorial plaques to your requirements. Some of the more popular solutions are all wood lawn memorials, wooden plaques fixed to oak posts with wooden dowels and oak crosses. These tough and maintenance free stainless steel plates are often used as Memorial Plaques. Unlike normal engraving, the lettering is not actually engraved into the metal. This has a major advantage - the lettering can be smaller and the images and logos can also be far more detailed. Even good quality photos can be used. Although not engraved into the metal the lettering is permanent and as tough as the metal beneath..
We can supply backing boards in various timbers on which to mount your memorial plaque. When ordering your backing board we would suggest it should be 25mm large than the plaque in height and width. We have a good range of tree stakes available. These include simple wrought iron tree stakes to modern angle iron with a security pin for mounting into concrete. 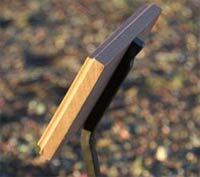 There are also wooden tree stakes and plaque holders for larger memorial plaques. Made from vitreous porcelain these memorial plaques provide a permanent outdoor memorial which is completely fade resistant. Available in various sizes, these can be produced with an image to the perimeter or with an edge faded to white. These can be used alone or mounted onto oak crosses, granite wedges, wooden, stone or corian plaques. Memorials cast in aluminium are cheaper than bronze, but still look very traditional and are also maintenance free. There are various images available along with a choice of four background colours. They come with tree stakes, holes or rear fixing studs. These plaques are available in a number of standard shapes which include oval, hearts and rectangles. These memorial plaques are ideal if you require detailed images in full colour. Military badges are a speciality, but almost any image can be used. The plaques are made from zinc plate which is durable and tarnish free. The background is etched away leaving lettering, border and image raised. The background is then painted any colour you want and the image hand painted to your specifications. We also have a printed brochure we can send you in the post.